in Shaker Heights from sports and recreation to home, family and shopping. Gauri Torgalkar is a native of India who received her Masters in Architecture from Kent State University. She is an Urban Designer and was an Adjunct Professor at the Cleveland Urban Design Collaborative at Kent State University. Torgalkar is a recent emigrant to Australia where she maintains an active career in urban design. To see Torgalkar's works click ﻿﻿here﻿﻿. 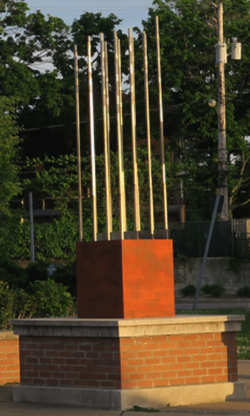 "Reeds of Light" is comprised of four structures located at the intersections of Avalon Court and Van Aken Boulevard. The next three sculptures, "Reeds of Light", "Grist Mill" and "Blowing Grasses" are the work of artist, Cleveland native Stephen Manka. The first, "Reeds of Light", showcases Manka's use of steel as a medium. "Steel and metal are great materials because they speak to Cleveland's heritage," says Manka. Stephen Manka is a modern metalworker located in the St. Clair Superior area. He is considered part of the new vanguard of an age-old tradition of highly skilled metalworking craftsmen of Northeast Ohio. He graduated from Miami University with a Bachelors in Environmental Design and went on to earn his Masters in Architecture and Ornamental Design from Kent State University. "Grist Mill " is located on the north side of Chagrin Boulevard between Avalon and Lee Roads. "Grist Mill" speculates on the machinery of the now lost Shaker grist mills. The sculpture is comprised of six enormous stone blocks showing the striated quarry cuts with one face deeply carved with the graphic toolings of a grinding wheel. The blocks are elevated by steel machine tables and appear to float above the grist-like tips of maiden grasses while the carvings seem to resemble flowers in full bloom. The artist Stephen Manka designs large scale public art including the provocative "Chorus Line" sculptures that are 30 feet in the air at Euclid Avenue and E. 14th Street. 1. Continue on Chagrin toward Avalon Road. 3. Sculpture is on the corner of Avalon and Kenyon.